The Hong Kong Council of Social Service (HKCSS) has once again awarded the 10 Years Plus Caring Organisation Logo to the Force. 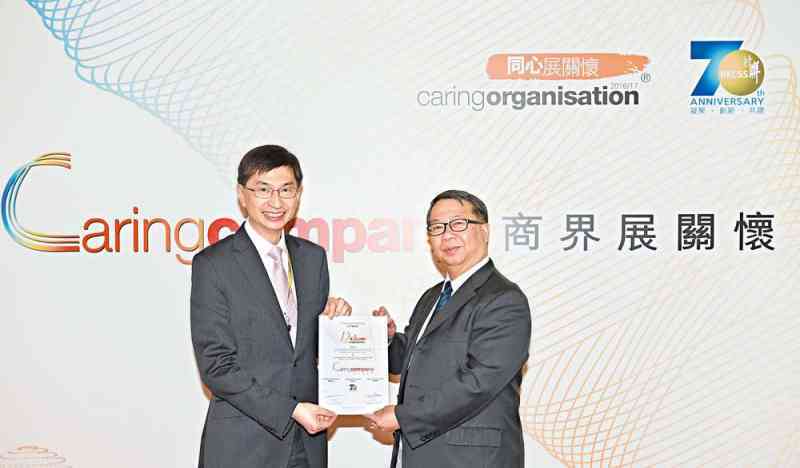 Senior Force Welfare Officer (Support Services) To Ming-yin received the award on behalf of the Force at the Council's Caring Company Partnership Expo 2017 at the Hong Kong Convention and Exhibition Centre on March 10. The Force was awarded the 10 Years Plus Caring Organisation Logo for the first time in 2015 for demonstrating good corporate social responsibility in "Caring for the Community", "Caring for the Employees" and "Caring for the Environment" over the years. The year 2017 marked the 12th consecutive year that the Force has been honoured with the Caring Organisation Logo. The Force is entitled to use the logo in promotional materials and activities from March 1 this year to February 28, 2018 as an indication of its status as a socially responsible organisation. Furthermore, being the recipient of the "Total Caring Award - Organisation 2006/07", the Force is entitled to display the designated logo in any promotional activity or material beyond 2007 as long as the Force continues to be recognised as a caring organisation. The new logo and its specifications are available on Frequently Used Internal Links on POINT. For enquiries of the use of the logo, please contact Force Welfare Officer Ms Shum Chung-ngar at 2860-6290 or by email to fwo-2-ss-ps&sr@police.gov.hk.